Taking photographs during the latest anti-terror exercises in Osh was prohibited. This image was made during a “clearing” police carried out in Osh mahallas in June 2010. 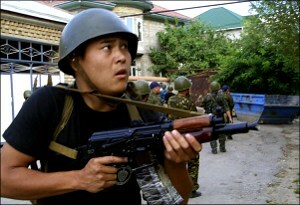 Power-wielding bodies of Kyrgyzstan staged anti-terror exercises in the southern city of Osh. According to official information, the Anti-terror Centre under the National Security State Committee (GKNB) held the drills on June 5 in cooperation with the OSCE Centre in Bishkek and regional subdivisions of the ministries of internal affairs, defence, emergencies, healthcare, border services and local self-governances bodies. It is worth noting that the GKNB’s mailing list was received today—June 5, the actual anti-terror drill day. The Fedchenko Uzbek-language School in Osh in 2012. Photo courtesy of Azattyk.kg. The Amir Timur neighbourhood (local residents also call it On-Adyr)—populated mostly by ethnic Uzbeks—is located on the outskirts of Osh. Busses run on central Selennaya Street, which is dotted with small markets, stores and cafes. The street leads to two adjacent schools. There was a sports ground between the schools, on which a police station was erected following the horrible June 2010 tragedy. 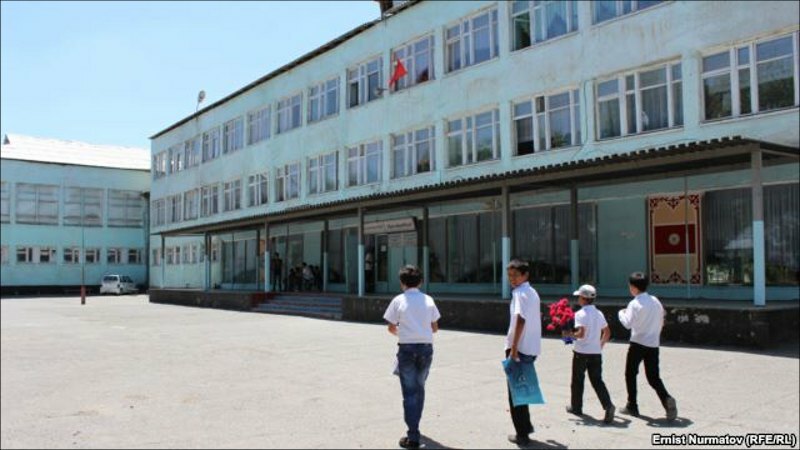 These are the schools and police station, most probably, the Kyrgyz power-wielders “freed from terrorists”. The military personnel—armed and mounting battle vehicles—blocked said main street. People living nearby were barred from using it and were told to find other ways if they had to get to work or anywhere else; or even better—“stay home”. Military tents were erected just five metres away from residential houses and armed servicemen were put on duty. All this lasted for three days… THREE DAYS! And with no explanations provided. The local residents have obviously got scared. They called their relatives in labour migration in Russia and told about the scarce information they had on tanks and mortars; shootings; children confined in their houses and flats. There were exit examinations scheduled at schools. (It was impossible to learn whether the schools were warned prior to the exercises as of this writing.) What is going on, after all? Why are they shooting? Why did they block the main street?.. Osh residents and natives still remember June 2010. Mass pogroms and killings accompanied by looting. Was it not terrorism? 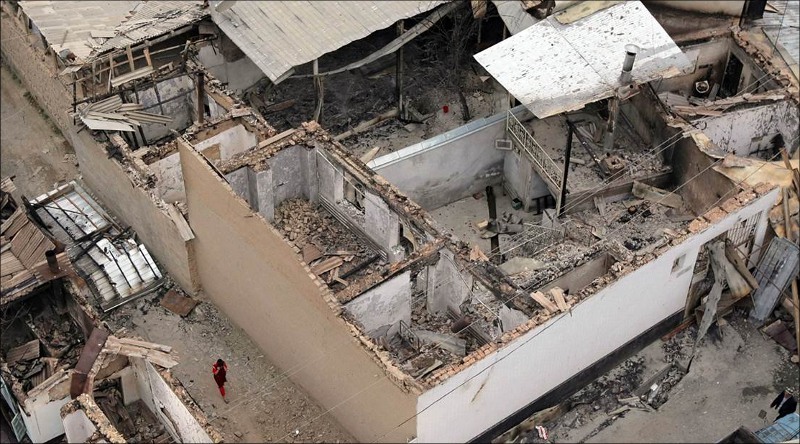 The fifth anniversary of the tragic June massacre is in just five days. Five years ago, the residents and natives of Osh experienced such a catastrophe that a mere appearance of armed “titular ethnic group” near houses of Uzbeks can cause fear and cast terror in their hearts; perhaps stir rage as well. These exercises became a theatrical reminder of what unfolded in June 2010, stirred memories of the horrible past events and disrupted the psychological recovery people were slowly experiencing. What for? Who and why did this immediately ahead of the tragedy anniversary? The following question is addressed to the OSCE Centre in Bishkek, which, according to the GKNB press release cited above, participated in the preparations for the anti-terror exercise in questions. Are you aware of the posttraumatic stress disorder? Are you trained in proper ways and methods of notifying the public? Would you do something like this in that very Europe that your organisation’s title bears? The GKNB and other power-wielders have never stood out for their respect humans. You are Europeans who live by higher standards and show more respect for fellow humans! Are you not? !